Update 1: 4 new sections were appended. My fingerprint is not recognized by Galaxy S5 Finger Scanner, what can I do? How to change or reset alternative password for Galaxy S5 Finger Scanner ? Fingerprint is not accepted by Galaxy S5, and I forgot the alternative password for Galaxy S5 Finger Scanner, what can I do? Galaxy S5 finger scanner is not a surprise to anyone in tech world. If you own iPhone 5s, LG G2 or HTC One Max, you probably are using finger scanner now. Actually, as early as in 2011, Motorola already equipped Atrix 4G with a fingerprint scanner. Of course, it was not found in subsequent models due to lack of acceptance from consumers. So, what does make Galaxy S5 Finger Scanner unique? As that in most other smartphones, finger scanner in Galaxy S5 can unlock your phone instantly by overriding other security settings, for example, pattern lock, PIN or passcode lock. This is not new. Atrix 4G could already do this in 2011. 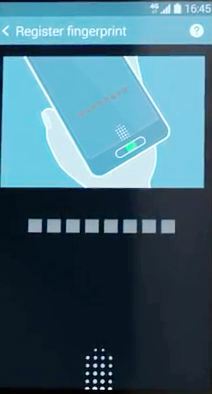 But Galaxy S5 finger scanner goes one step further by integrating with Samsung services and even third-party services (e.g., PayPal). This is a big deal, and it makes Galaxy S5 finger scanner very unique. Remember, Apple’s Touch ID is only integrated with Apple’s own stores (e.g., iTunes store, App store and iBooks store). There is no third-party support at all. 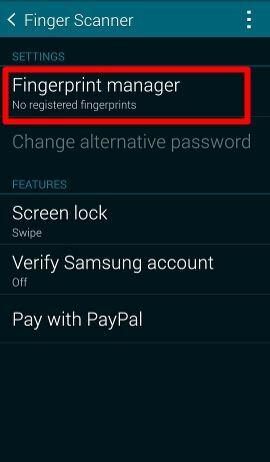 Because Galaxy S5 finger scanner is integrated with Samsung account, you can use your fingerprint instead of entering your Samsung account password when purchasing contents with Samsung services (Samsung Hub). You may be not impressed, because there are still very limited contents from Samsung Hub. Samsung account is not as useful as an Apple ID. 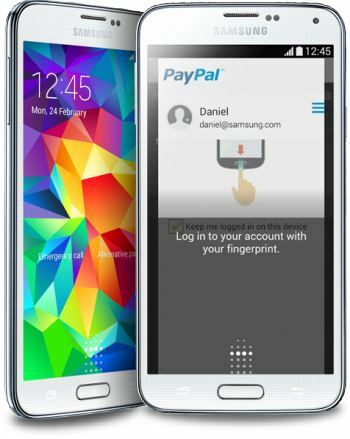 Galaxy S5 finger scanner is also fully integrated with PayPal, one of the most popular online payment systems. Now you can make faster and more secure payments via PayPal with the swipe of your finger. This PayPal third-party support of Galaxy S5 finger scanner makes your online order very easy and secure. 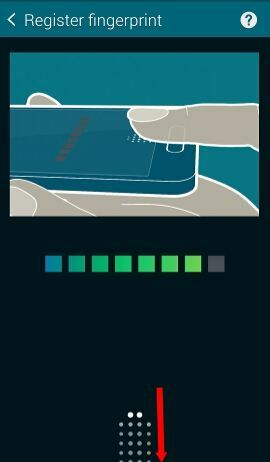 Another unique feature of Galaxy S5 finger scanner is unlocking the private mode. You can keep some documents, videos and photos in private mode so that only your fingerprint can unlock them. This will surely add some security to some of your private files. Will Galaxy S5 Finger Scanner cause privacy issues? Whenever fingerprint info is collected, we intuitively may concern about the privacy linked to such biometric identity info. Samsung makes it clear that all fingerprint info is only saved locally. So the security of your fingerprint info depends on the security of the device, Galaxy S5. The privacy is under your hands, not Samsung’s. As Samsung probably does not make copies of your fingerprint info, the privacy concern on Galaxy S5 finger scanner is not as big as that for iPhone 5s. Very likely, Samsung does not save the fingerprint images as well. As Apple did, Samsung probably saves some sort of mathematical representation of your fingerprint in your Galaxy S5. This is different from your fingerprint image. As such encryptions are one-way, very unlikely, your fingerprint image can be reverse-engineered. How many fingers can I register for Galaxy S5 Finger Scanner? Galaxy S5 finger scanner allows you to register up to 3 fingerprints. Does Galaxy S5 Finger Scanner make you safer? Finger scanner adds one additional layer to protect some private data on your S5, and makes it a bit easier to access you phone in a secured way. Using fingerprint for online purchase is very likely safer than typing password, especially when you are using a public WiFi. So far, there are no proven methods to crack the fingerprint info (reverse engineering fingerprint info to fingerprint images). In the worst scenario, if it is cracked or stolen, you can simply de-register your fingerprint info with PayPal or other third-parties. In short, Galaxy S5 finger scanner will very likely give you more protection and convenience. register up to 3 fingerprints. you don’t want to use fingerprints. your fingerprints are not accepted by your S5 for whatever reason. There is no easy way to reset this Galaxy S5 fingerprint alternative password. So, remember and write this password. From Settings screen, tap Finger scanner. Fingerprint lock. Unlock your S5 screen with your fingerprint. When registering your fingerprints, you need follow the on-screen instructions. You need swipe your finger down from the location highlighted on the screen to the home button. It will ask you try several times to take a correct fingerprint. Please make sure your finger is dry. 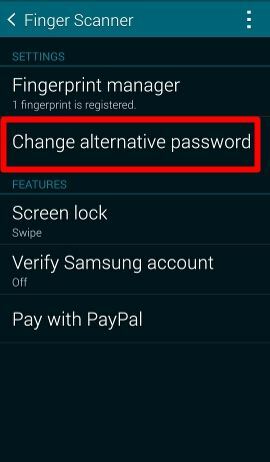 Before saving your fingerprint info into Galaxy S5, fingerprint manager will ask you to set up an alternative password. This alternative password can be used whenever the fingerprint is asked. The password must be alphanumeric (a combination of alphabetic and numeric characters). If your password does not meet the requirement, you will be asked to give a new one. Write down your alternative password and put it in a safe place. Once one or more fingerprint is registered through Fingerprint manager, you are ready to use the 3 main features of Galaxy S5 finger scanner. to ensure you are using the finger registered already. You can register up to 3 fingerprints only. The other 7 cannot be recognized by Galaxy S5 Finger scanner at all. to ensure that your fingers, the screen and the home button are clean and dry. to ensure that the Home button is not scratched or damaged by metal objects. to swipe your finger at a moderate speed to allow the device to recognize it, not too slowly, not too quickly. You can always use the finger scanner alternative password when you can use fingerprints. The fingerprint alternative password cannot be reset through your Google account or Samsung account. The alternative password is saved locally in Galaxy S5, together with the fingerprints. You can change the alternative password in Settings–Finger scanner–Change alternative password. If you forget the alternative password, you can clear this password by de-registering all fingerprints. In other words, the alternative password will be cleared when there is no registered fingerprint info. This is the only official way to reset the alternative password. To de-register a fingerprint, you can enter fingerprint manager, tap the menu key (3 vertical dots), tap Deregister, then tap one of the fingerprint to remove/de-register it. Alternatively, you can tap and hold any of the fingerprint until it is selected as shown below. Then tap the delete (dustbin) icon to de-register it. Once all fingerprints are de-registered (removed), the alternative password will be removed automatically. So, you can register your fingerprints and setup a new alternative password again. In the worst scenario, your fingerprint is not accepted, and you forget the alternative password, there is NO way to reset the alternative password unless you perform a factory data reset. If your phone screen is locked with fingerprint, and you cannot unlock it now, you can use Android device manager from your PC to unlock your S5 with your Google account. Google put a nice guide here. Please note, Android device manager can unlock yoru phone, but it does NOT reset your finger scanner alternative password. Samsung provides similar functions to unlock the phone or wipe the phone with your Samsung account here. Do you have any questions with Galaxy S5 Finger Scanner? Settings> finger scanner> Fingerprint manager> top right corner click down drop n add fingerprint. What if all 3 of your fingerprints can’t be read? How do you make it work? You can use the alternative password. With the alternative password, you can de-register the fingerprints and register again. But I can’t remember my alternative password either 🙁 So basically I forgot my fingerprint alternative password and my fingerprints can’t be read, is there any way to reset it without resetting the phone? You probably have to backup your data and perform a factory reset. My print also doesn’t work and my backup password are forgotten.. worst part is I do not have a registered google adress wht now? If you have no way to unlock the phone now, you probably have to reset your s5. You can visit Samsung service center and ask the staff to do it for you. If you know what you are doing, you can remove the battery, then not the phone into recovery mode to reset the phone. Please note, you will lose all your data when resetting the phone. You can try to backup your data to your pc through the USB cable connection first. Settings – backup and reset – factory data reset. Samsung may add more fingerprints in future update. how do you recover your alternate password in the finger print scanner? The system keeps rejecting what I know is the correct password. I wrote it down but the system keeps rejecting it. There is no way to recover the password. Probably, you have to do a factory reset to set a new one. You can go to android device manager from your PC, locate your phone, then choose to unlock the phone. This will reset any passwords on the phone. Of course, you need the Google account (the one used for the phone) to log in your Android Device manager. Hi im locked out of my s5 ive forgottn my emaik and password how can I reset my phone? That will wipe app your data. You may try to retrieve the Gmail password first. No, it will not. If you want to reset the phone, you need tap factory reset (not in the same location). You can de-register all fingerprints. This will erase the password. Then, you can re-register fingerprints and set a new password. At least 6. And the alternative password must be number + letter (alphanumeric). How do I disable the scanner so I don’t have to use it every time I swipe my phone? Settings–lock screen–screen lock. Change it to swipe. Also I have forgotten my alternate password so can the above question be done without the alternate password? Did you try your Google account password? I have forgotten my alternate password but my fingerprint still works i have read that i can delete my fingerprint and my password will be reset is this true? yes. If you delete all, you will be asked for a new one when you try to register new fingerprint. The only options i have on android device manager are ring & enable lock and erase can anyone help pls? Choose lock. It actually unlocks the phone and resets/clear password. You probably turned off location service. You can try to ring the phone. If it rings, you can still unlock it with android device manager. How do I change my fingerprint and alternative password? It keeps saying mine is wrong and there is no option to delete a fingerprint or change the alternative password. Is there no way to fix this? the only option I have is fingerprint>fingerprint manager (for which I have one fingerprint registered but I didn’t register it so obviously my fingerprint does not work and I have tried every alternative password I can think of and none work) How can I change my alternative password with out knowing the current one? There is no drop down option to delete a registered fingerprint on my S5 HELP! Tap and hold fingerprint 1, you will then have the option to de-register it. Once you de-register all fingerprints, the alternative password will be cleared automatically. Settings–Finger scanner. Once register your fingerprints, you can use it to unlock the screen. You can also use fingerprints to access paypal. I dont see the option about paypal when I go into the finger scanner option… what to do?? It is inside PayPal app (log in options). Please note, you must download the PayPal app from Samsung apps, NOT from Google play store. If course you need set up your PayPal about as well before you can go to the login options. My fingerprint scanner has stopped working (for both prints I had saved). How do I erase the prints I have saved and create a new one? Tap and hold the fingerprint, then you have the option to delete it. I just got the new s5 and set a finger scanning password but it doesn’t ask me for it when I unlock my phone. Is there something wrong? the password you specified when you started to register fingerprints. My fingerprints aren’t working all of a sudden. Is there a way to reset them? If you remember the alternative password, you can de-register the fingerprints. If you forget the password and the fingerprints don’t work, you probably have to reset the phone. If you just want to unlock the phone, you can use android device manager on your pc with your Google account. How do I de-register the fingerprints?? 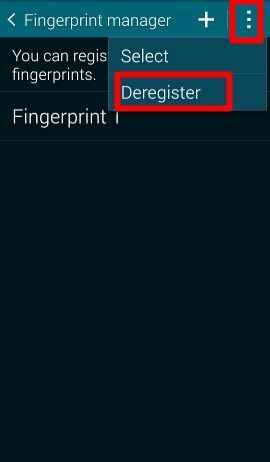 Go to fingerprint manager, tap and hold the fingerprint, for example, fingerprint 1,then you have the option to de-register it. Alternatively, in fingerprint manager, tap the menu key (3 vertical dots), you can find the de-register option, then you choose the fingerprint. PLEASE HELP!!! I cannot remember my alternate password and when I select fingerprint it brings up screen with fingerprint scanner and above it says alternate password with X to exit. When I swipe my fingerprint it brings me back to home screen. I tried the device manager and it changed password to unlock screen but NOT the alternate password….. Figured it out… thanks anyway!!! I guess he pressed too hard on home button when swiping fingers down. Your finger must swipe through the home button, but you should not press it when swiping over it. If the phone still accepts your fingerprints, you can de-register all fingerprints. Then the password will be cleared. Yup, this work, thank God! At this time, probably there are no such apps. hi my fingerprint keeps on rejecting i after several times trying then it takes. i dont know if the screen protector but that should be problem. please help. Screen protector normally is not a problem. Most of the time, the problem is related to the way you swipe over the home button. My problem about this fingerprint scanner is about the 30 seconds ban. Lets say i have to make a call, an urgent one. If i miss fingerprint 5 times in a row (by any reasons), i have to wait 30 seconds to make a call… This can be very annoying and frustrating. The way i see it: if i miss five times the fingerprint scanner, let me introduce the alternative password immediatly… not after 30 seconds. Second annoying thing: i usually keep my S5 in my pocket. I choose the fingerprint scanner because the phone was constantly unlocking in my pocket and opened different applications without me knowing it. I hate password interface – result, i choose fingerprint scanner. Problem is that in my pocket the power button activates somehow (tight pocket), consumming the five fingerptint attemps. So i get the phone out of the pocket, miss a fingerprint or two… and bang 30 seconds ban. This issues needs to be fixed somehow. If i am missing a setting, please let me know. I don’t think there are any settings for this. Pattern lock probably should work for better. Oh my god I hate this function too! If the finger print scanner ever worked first time then it would be ok! But it always takes about 5 goes. I do not want to spend minutes of my life everyday waiting for my phone. Greatly inconvenient and pointless!!! What is the point? Please Samsung make there an option to switch this off. It is making me frustrated with this handset. you can de-regster all of your fingerprints. This will essentially disable this feature. I set up fingerprint scanner but was not prompted to create alternative password. Now I can’t change the unlock method without entering the alt pw. Does the s5 come with a preset alt pw? S5 always ask alternative password when your register fingerprints. As your phone still recognize your fingerprint, you can go to Settings–Finger scanner–Fingerprint manager to de-register all fingerprints. Once all fingerprints are de-registered, the alternative password is erased. Now, if you start to register your fingerprints, it will ask you to provide a new alternative password. Very likely you set up any VPN accounts or any exchange email accounts on your s5. If any of such accounts was added, you have to use pin or password. This is enforced by the system . Of your fingerprints are still accepted, you can deregister all fingerprints in fingerprint manager, then the alternative password would be cleared. Can the Galaxy S5 be set for extra security? Use both the finger print & the password together? IE: Enter the password & then the finger scan? Fingerprint scanner is a low security setting. 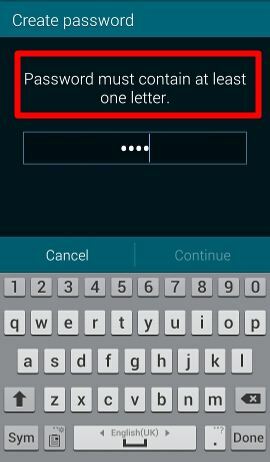 password is the strongest security setting in Android. No, you cannot combine two locking/unlocking methods. I have retried my fingerprint 15 time and now has gone into password mode only which I forgot. Is there any way I can go back to the fingerprint and to try it again. I don’t want to reset I have some wedding photos I don’t want to loose. Rebooting the phone may allow you to try fingerprint again. If the screen unlock requires fingerprint, you can use android device manager to unlock the phone with your Google account from your pc. There’s no official way to reset the alternative password without resetting the phone if your fingerprint is not recognized. You may check with local Samsung service centre for help. If it’s easy to reset such settings, it would be against the purpose of this security measure. Thank you. I done it through the Android device manger. My Samsung Galaxy s5 constantly rejects my fingerprint and now no longer even lets me attempt it, requiring the alternative password, which of course, it does not recognize either, despite me remembering the password. Now what? Can’t even use this phone. Very disappointed in this purchase. If you used fingerprint to unlock your phone, you can use android device manager to unlock the phone with your Google account (from your pc) . But this will only unlock the screen for you; it will not reset your alternative password for fingerprint. I set up one fingerprint, but it didn’t work all the time. I used to unlock it with my gmail password, and never set up an alternative password. I got tired of having to type the password, so I went back to pattern. Now it won’t recognize my fingerprint at all. When I go into finger scanner, I don’t have the three-dot menu, so I can’t deregister my current fingerprint. Is there a default alternative password if you never set one up? There is no default alternative password for fingerprint scanner. Before you can register your fingerprint, an alternative password must be setup. In fingerprint scanner, you tap fingerprint manager. Then you can find the 3 dots on top right. No, the three dots disappear as soon as I tap finger scanner on my S5. If you cannot get the 3 vertical dots menu option, you can tap and hold the left key (left to Home button, i.e., the recent apps key) to get menu options. Anyway, if the problem persists after rebooting, you may have to reset your phone or visit Samsung service centre. Please backup all your data before resetting. Different s5 owners may have different stories. It’s up to you to apply the update or not. There are no major issues in galaxy s5 update so far. I would recommend you to update. For fingerprint login issues, it happens to a few s5 owners. Most users have no issues. Battery life is as good as before the update. Yes, I did reboot for 2-3 times already. It’s very strange for me that as far as I understand some devices lost the Fingerprint scanner/reader as users attempts it several times. But, for my case I didn’t attempt it several times. Also I didn’t notice the disappearance of Fingerprint scanner/reader instantly as I didn’t use my mobile frequently in a day. I have checked folders in my phone at my PC to back up the files and photos but no folders appear in the device too. So, I really don’t know what is going on with my Samsung Galaxy S5. If you cannot unlock the phone with Google account, you porosity have to visit Samsung service centre. They probably will reset your phone. You can download and install Kies 3 on your pc. This will install the correct USB driver for s5. In Kies 3, you can backup most contents in your phone. So, I read through all of this, and it didn’t answer my question. I know you can register 3 sets of finger prints, but the last time I tried to register a separate set of finger prints it didn’t accept mine nor my boyfriends finger prints. I even activated my Samsung account with the fingerprint scanner. My question is, can you use two sets on fingerprints at the same time? If so, how do I do this? Yes, you can use up to 3 different fingerprints. What error did you get when you registered the second and third fingerprints? It would tell me that neither sets were registered to the phone. Had to use the alternative password. You can deregister them, then register again. When register, make sure swipe many times with slightly different force. You cannot change it, unfortunately. You may try other third-party launchers if you really need something different. finger scanner not responding because I have a otter defender cover which, I guess, makes the swipe over the home button too short? looking for a solution so I don’t have to use password code and can continue to use a protective cover. There are no known solutions for this. The Otterbox case/cover has relatively high edge and it is too close to the hone button. But this is necessary to give the advertised protection. Samsung’s implementation of finger scanner in S5 requires swiping through the home button. This is very difficult when you have an Otterbox case/cover. Phone locked and asking for alternate password which I have forgot. Not showing fingerprint sensor. How do I make the phone show the fingerprint scanner so I can unlock the phone ? You can unlock the phone with your Google account from Android device manager from a pc. Rebooting the phone should give you the finger print option. It’s important to remember the alternative password. “An error has occurred with the finger print sensor. If this message appears repeatedly, restart your device. Does Not Allow Me To Use THE Finger Print For Lock Screen OR Does Not Let Me Use THE Private Mode . If restarting the phone doesn’t solve the problem, you need visit the service centre. If you’re trying to change your type of phone security from a fingerprint to a pattern do you also need the alternative password? Pattern lock always requires you to set up a new backup password. But you can user Google account to unlock the phone if you forget both of the pattern and the password without using Android device manager. The alternative password for finger print is for fingerprint scanner. It is not related to the backup password for pattern lock. No, well…. what I actually meant was after you’re already unlocked do you need another password also to change the type from fingerprint to a different type i.e. a pin or pattern lock? If your fingerprint is accepted, it should never ask for the alternative password. In other words, alternstive password is asked only when your fingerprint is rejected. Anyway, for your case, no, it should not ask. My mum’s galaxy s5 got stolen. Fingerprint and password was enabled but she didn’t load any app to track the phone. Can samsung track her phone using serial number? Or can anyone use her phone by doing factory reset, creak etc etc ??? By default, the location service is probably on, you can try to check it from Android device manager on a pc with your Google about. Just Google Android device manager then follow it. If the phone is stolen, it’s easy to reset without knowing your password or fingerprints. Most data in the internal storage will be erased, but data in SD card will not. In the warranty card and the box , you should have the IMEI number and serial number. Provide such info to police immediately. Your phone company also knows the location of the phone that using the sim card. But they probably will only provide such info to the police. In addition, you should call your phone company to lock the sim card. If your mom is logged in on her phone with a samsung account you can track here phone on the samsung site. No, there is no way to retrieve the password because it is hashed. For security reasons, Android and most apps do not save plain text password. How do I disengage the integration of the fingerprint scanner from other applications? I only want it to unlock my phone, not other apps. In settings – finger scanner, you can find it. It can only be used for screen unlock, PayPal login, website login. You need manually enable them individually. By default, all is off. My friend has a galaxy 5s but the finger scanner app is not on his phone…..how can he get the app on his phone? What is exactly the model number? Galaxy S5 duos (SM-G900FD) should have finger scanner. I have a message saying there was an error in the fingerprint sensor specifically “”AN ERROR HAS OCCURRED WITH THE FINGERPRINT SENSOR. IF THIS MESSAGE APPEARS REPEATEDLY, RESTART YOUR DEVICE.” of course i did soft reset, hard reset and nothing worked, backed up the phone and did factory reset and still not working. If factory data reset doesn’t help and it doesn’t work in safe mode, it is probably a hardware issue. Then you probably should visit the local service center. You cannot do anything if it is a hardware issue. Read EVERYTHING. Trying to deregister fingerprints and forgot alt password. 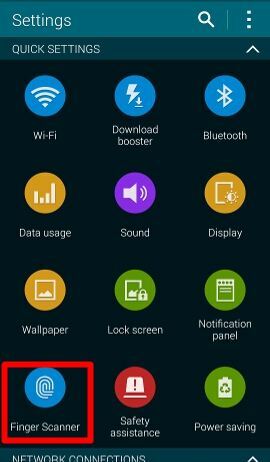 No one mentioned since the update, there are no dots in top right corner under Fingerprint Manager. When holding the “back” button, nothing happens either. Help? Does the phone still accept your fingerprint? My galaxy s5 will not let me use the finger scanner, everytime.i try to use it it tells me “an error has occurred if this messages shows up repeatedly reset your phone a try again” this has showed up for months. As the message suggested, you may backup the phone, and reset the phone. Then you can try again.